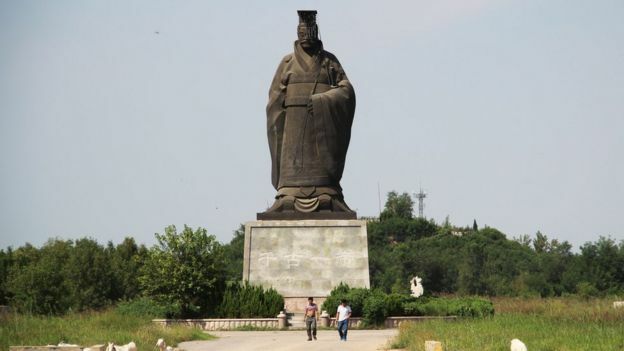 A giant statue of China’s first emperor has fallen flat on its face – all six tonnes of it. The 19m (62ft) bronze cast of Qin Shi Huang was blown from its stone pedestal in Shandong province during high winds on Friday. It landed face-first, crushing the head of the terracotta-warrior emperor “like a pancake”, according to state-run outlet Global Times. Workers quickly arrived with cranes to remove the multi-tonne metal remains. Photos of the toppled statue in Binzhou showed its centre was hollow, supported by a metal framework. Qin Shi Huang was the founder of China’s Qin Dynasty and is credited with being the first man to unite much of modern China’s heartland through conquest, around 221-206 BC. He built the first sections of the Great Wall of China, and his tomb is home to the famous army of thousands of terracotta soldiers. The ill-fated pancake-faced statue at Binzhou was built in 2005 to attract visitors to a local tourism resort, according to the AFP news agency.